Being an Indian you can never get really settle with the Patriotism you have got in your blood. Why wouldn’t it be? Afterall we have got freedom after 200 years of struggle. We still get goosebumps and sometimes even shed tears while watching Patriotic movies. I still remember how loud I used to sing the National Anthem while standing in the school assembly during my school days. I’ve got a chance to witness the Wagah Border Parade ceremony in last summers. It is the lowering of the flags ceremony which has been0 practised daily by the Para Military force of India and Pakistan Rangers. I realised how tough it is for our soldiers to march and display strength of our nation with their heavy uniforms and colourful headgear in the hot weather of Amritsar. The local crowd along with the VIPs cheer with nationalistic enthusiasm to our soldiers to let them know that we are standing behind them always to support and respect their ultimate Sacrifices. Often Known as The Berlin Wall of Asia, the Wagah Border is one and the only Border Crossing between the two uneasy nations. Located on the highway between Amritsar and Lahore, it is definitely something everyone should see while visiting Amritsar. The journey from the Golden Temple to the Wagah Border is about an hour long. It is about 35 km and there were 5 of us in the car. 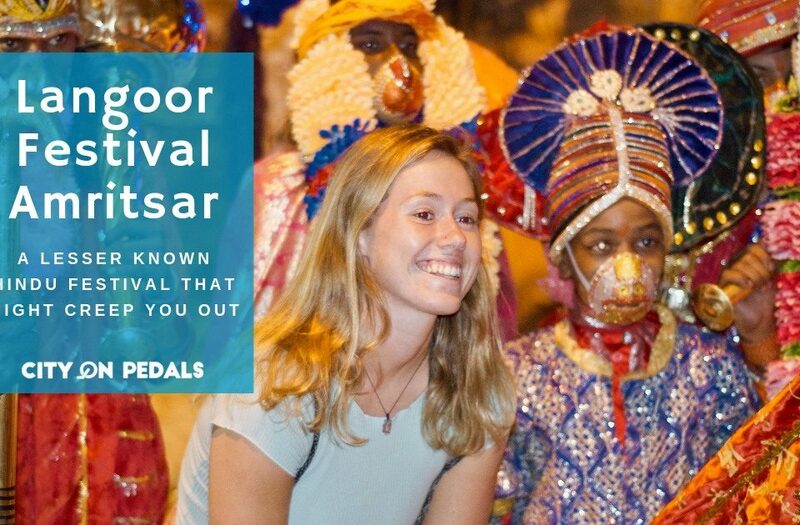 There are many options for you to get to the Wagah Border like cabs and auto rickshaw. 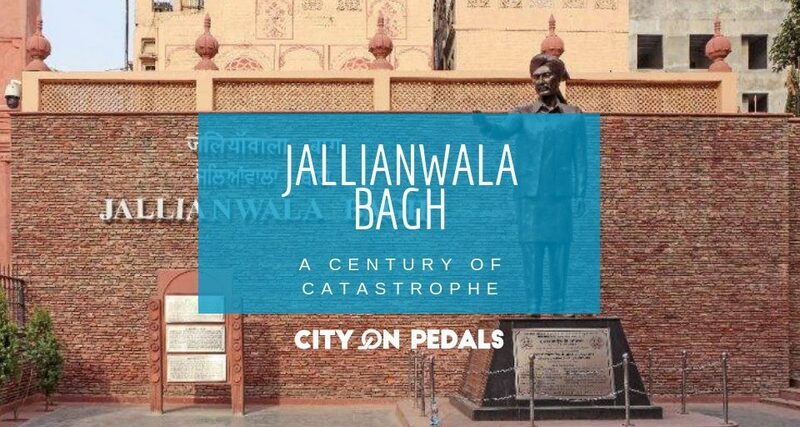 You will find many Cab drivers asking you to go to the Wagah Border at the Golden Temple and Jallianwala Bagh Complex. It is recommended to reach there earlier in the afternoon as there is a huge amount of Crowd. 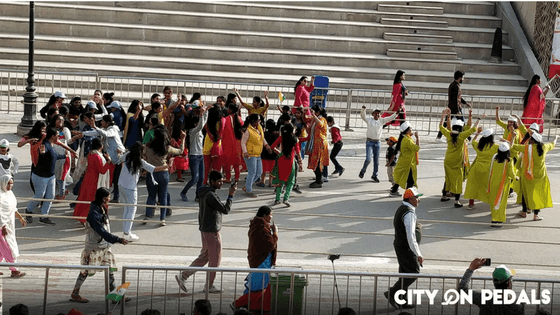 Approximately a number of 18000 visitors come to catch a glimpse of this nationalistic piece of India. I felt even more patriotic when I reached there by seeing the enthusiasm among other visitors, especially in the girls and women. There is a 1km walk from the drop off point to the ceremony area. It seems daunting especially under the blistering heat of summers. The mass amount of crowd gathered usually even before the ceremony begins. We have heard that the luggage is not allowed inside the premise, so without taking the risk we left ours inside the car and brought only the essentials. Pro tip: If you are a foreigner, come along with your passport. You can stand in a VIP queue which is much shorter and less chaotic. After reaching the ceremony premise we quickly sat on the steps and started waiting for the Parade and then the action began. Music blasted through the speakers and the local females started walking to the centre of the stage. Initially, they were moving their body slowly but as the moment got heated up, other women also joined them and this resulted in a cheerful dance. Witnessing this was so electrifying, as the women were dancing, cheering and expressing their pride for our Country. Men weren’t allowed to join the party so they were recording the dance with their cameras and smartphones standing on the stairs. Everyone was lost in the moment, women of all ages and nationalities even the older women were dancing and had zest in their movements. 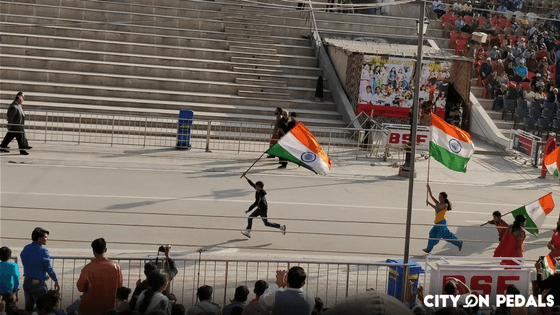 After the females went back to their seats, some girls and women were invited by the army officials to carry the flag and run to the border gate and back. They run across the stage by carrying the flag so proudly. I was so amazed to see that how patriotic was everyone at that moment. That unique feeling of being an Indian was something- I’ve never experienced before. Just after the festivities, the parade started. The soldiers were from the Border Security Force(BSF). There were 15 soldiers including 2 female soldiers who were partaking in the Parade. Their unique ceremonial uniform with headgear spreading out like peacock’s feather (which also signifies our National Bird) was also giving an aura of importance and solemnity. The soldiers stretched their legs upward aggressively. They were marching together in a strict formation and often kicked their legs high up to showcase our strength. 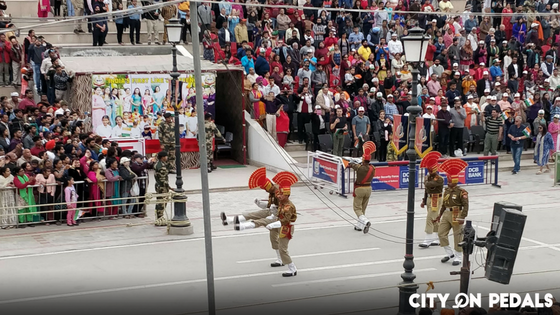 The parade was really magnificent and exhibited the discipline of our soldiers who are protecting our borders selflessly. Besides this, it was also to showcase Pakistan the unity and the strength of our country. The loud cheering from both the nations made the atmosphere even more intense. Each time the shouts were getting more louder. Every cheer was filled with nationalistic enthusiasm. I have seen the Republic Day Parade many times in my childhood. But experiencing something like this was totally different and amazing. The most amazing moment for me was the flag-waving show by the women. After an hour of parade and cheering, the ceremony came to an end when the soldiers from each side lowered the flags. They saluted each other and shaken their hands. This ceremony is to show the rivalry as well as the brotherhood between the two nations. It is also to show that despite of so many differences between the nations we will still cooperate with each other. If you are lucky enough, you can witness the special bus Sada-E-Sarhad, that travels from Delhi to Lahore. It has been started by a common agreement signed by both the countries. 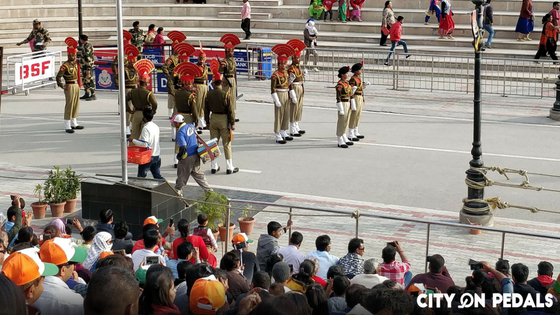 If you come to Amritsar, I would definitely recommend a visit to the Wagah Border because the ceremony is definitely one of its kind. 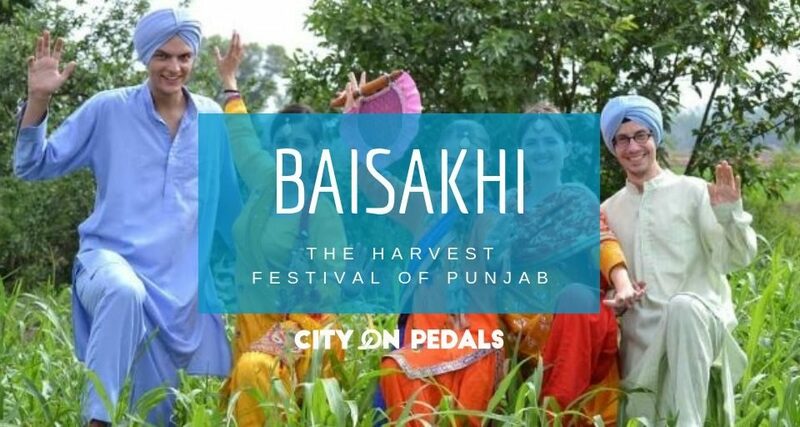 The visit is free, and you get to see the locals dancing on the Bhangra, cheering loudly for India, sharing their love with one another and showcasing the respect for the soldiers with pride. 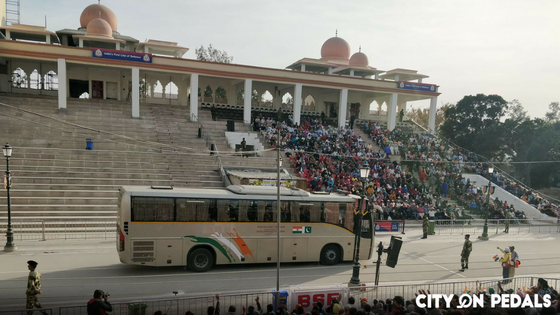 It will also take you to an hourly long nationalistic ride in which you will witness the strong bond of unity and strength that resides among the Indians.